Make bedtime special with personalised pillow cases you design. They come as a single slip which you can personalise however you wish. Upload photos, artwork, or text, and design your custom pillow cases in minutes with a single photo or creative collage. Custom pillow cases are a great way to have a favourite photo, design or montage take pride of place in your bedroom. 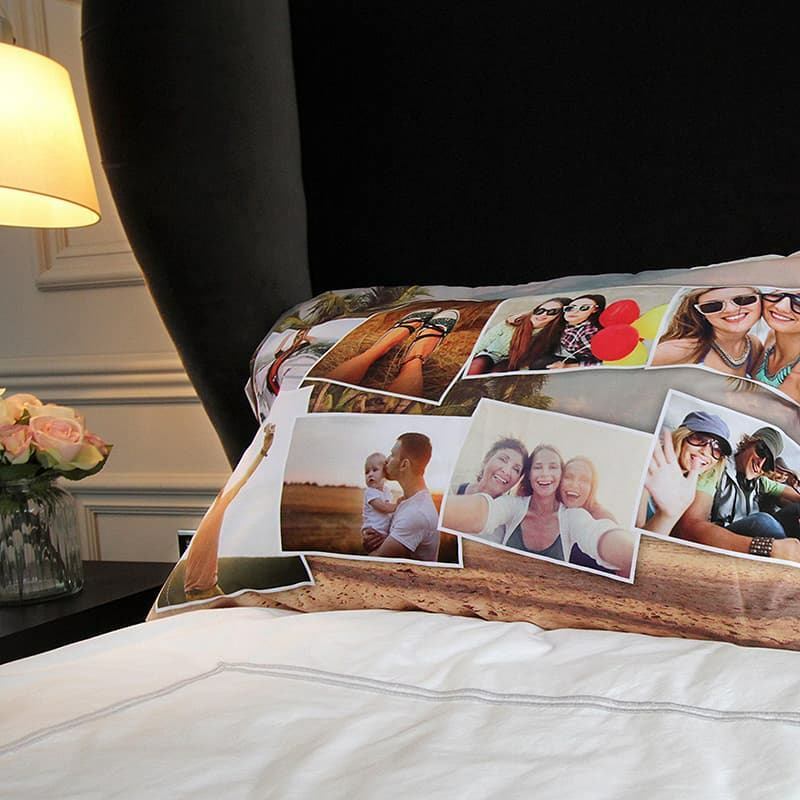 Design a photo pillowcase using all your favourite snaps, or print you and your partner's name for a romantic gesture. The pillow case is a slip design, meaning you can easily insert and remove your pillow without having to fiddle with zippers or buttons. Personalised pillow cases are made from soft peached poly sheeting which is a breathable fabric. They are incredibly easy to care for as they're machine washable. Not only do these custom printed pillow cases produce amazingly detailed prints, but they also guarantee exceptional comfort. Honestly, it has been years since we have come across such a brilliant product and service! Everything is so easy to use and so fast! I bought the pillow cover for a friend's 40 with a funny image as a joke but the quality is so good I think I'll order some more for me. I was very impressed with firstly how quickly the order was processed and then arrived. Was kept in the loop as to it's movement and final delivery. The item itself come up a treat - being a Christmas present, my wife won't express her feelings until then but for the others that have seen it they all love it and think it's a great idea. Will definitely being ordering something more again soon. We make our photo pillow slips with edge-to-edge printing on high quality material and then cut, and sew to order in our facility. They are well proportioned, and fit standard pillows with a slip and flap closure. We don't supply with the pillow so this makes dispatching and receiving easy. Cases also make a great unique gift for relatives abroad as they are easy and light to post, and deliver a terrific surprise. We use the same material for printed bed sheets (fitted and flat), and our personalised doona covers, all of which you can see in our bedding range where you can add matching blankets and throws too. Care: Machine wash at 30°c. Tumble dry safe. No ironing required if dried flat. We print with a special method which fuses the inks to the fibres of the pillow case fabric. We never use plastic coatings or waxy inks that sit on the surface of the pillow case. Our material feels great and breathes well too. When you touch our printed pillow cases you cannot distinguish the print from the textile because our print technique permanently bonds the image and fibres. Once complete, your personalised photo pillow cases are lovingly sewn together to create the finished piece. In just a matter of days, you'll be stuffing your new photo pillow case and admiring its quality. One of the most popular sellers is our collage option where you can upload several photos and use our collage app to automate a montage on pillow cases. This is ideal for printing 20 or so images and capturing a special event, occasions like weddings, or holiday snaps. The montage is easy to create, and you have options for different layouts and styles. Once you have uploaded the images, you can easily mix it up and select the best collage for your pillow to suit your style. Lots of helpful tips and advice is provided in our preview system. Press start design above. To print single photos on your personalised pillow cases is just as easy. You simply need to upload your chosen image and position it to your liking. For a fun prank-style gift, you could choose a goofy photo of your friend's face and print it on a pillow case. Perhaps you could add your own face on the reverse side of the pillow. This unique gift will be sure to get everyone talking and won't be forgotten. Perhaps you want to print a family photo from an occasion when all the gang, young and old, from near and far, got together. This would be a perfect gift for someone who lives far away from the rest of the family, letting them know they're always in your thoughts. For young families, photos of their bundles of joy printed on a set of pillow cases will warm their hearts. The kids will always be with them, even when they've grown out of their baby faces and get embarrassed by their baby photos!